In Front Royal deck and log home restoration cleaning agents are used to remove mildew, grayed out wood fibers and oil based stains and sealers. With proper dilution it can be applied to the wood preferably by spraying but also can be brushed on. It is very important to note that proper safety measures are taken when using this method . If there is no sealer on the deck or if only traces remain, a mild solution of Sodium Hydroxide and a good surfactant can be applied and allowed to dwell for a predetermined length of time. This allows the mixture to soften up the surface contaminants and degraded wood. A scratch test can be preformed to determine how easily the deck will clean up. If it is hard to remove, either more mixture will have to be applied and/or more dwell time allowed. If it is determined to be at a point that it can be removed, then a pressure washer will be used to remove a very thin layer of the degraded wood and any stain or other contaminants such as mildew, grill grease, flower pot stains, etc. 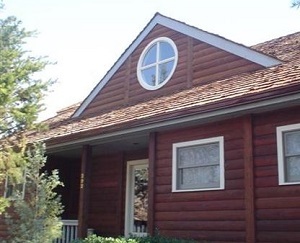 Our professional Front Royal deck and Log home Restoration experts have the experience and the solutions ot assist you with all of your deck and Log home Restoration needs whether they are large or small you will know that you have made the right choice when you call on our expert staff. If you're looking for a professional pressure washing contractor in Front Royal then give us a call 252-266-9457 or complete our online request form.